Kalaratri form of Durga is worshipped on the seventh day of Navratri. She is worshipped on October 16, 2018 during Navratri. The day also marks the beginning of worship of Goddess Saraswathi during Navaratri in many parts of India. Goddess Durga is also worshipped as Dhoomavati and Jagdamba in some regions of India on the seventh day. Kalaratri is the one of the fiercest forms of Durga and her appearance itself evokes fear. 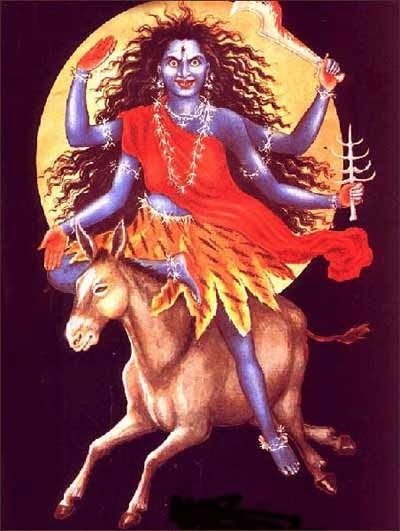 Kalaratri is depicted as having four hands and her vehicle, or mount, is a donkey. She can curse and bless and is known to create havoc. This form primarily depicts that life also has a negative side – Tamas. The three day worship of Goddess Saraswati during Navratri also begins on this day. Durga Maha Saptami Puja is held in Bengal, Orissa, Jharkhand and other eastern parts of India on this day. Dhoomavati and Jagdamba forms of Durga are worshipped on this day mainly in the western parts of India. It is believed that she has power and influence of Shani Graha. Those facing problems associated with Shani Graha should offer prayers to Kalaratri to overcome them. She also has power and influence on the 10th and 11th house of the horoscope or janam kundli. She helps all those that follow Dharma. She blesses them with job, fertility, peace, prosperity, luck and profit. She has to be worshipped facing west. She prefers blue color offerings. The best offering include blue color flowers.